55-3277 at Australian Army base, Nui Dat / Luscombe Field, Vietnam. • 55-3277 United States Army. Delivered on 19th May 1956. Designated as U-1A. April/May 1957 to Brookley AFB, Mobile, Alabama. Here the aircraft were loaded on board the 'USS Tripoli', an aircraft carrier then serving with the Military Sea Transportation Service, which set sail for Bremerhaven, Germany arriving on 16-May-1967. By January 1962 the aircraft was serving with the Southern European Task Force, SETAF, based at Verona in Italy. In April 1962 it joined the Headquarters Company, First Brigade, 8th Infantry Division, Germany. Coleman Barracks, Mannheim, Germany for maintenance May-1982. In November 1962 it re-joined the 2nd Aviation Company in France until July 1966. Noted at Prestwick - EGPK, Scotland 23-May-1964 by Neil Aird. Jul-1966 into storage at Coleman Barracks, Mannheim, Germany. 66th Aviation Company, Bonames, Germany, between Jun-1967 and Oct-1967 when it returned to the depot at Coleman Barracks. Returned to the USA and then to Vietnam with the 54th Aviation Company in Mar-1968 until disbanded in Jan-1971. It was then entrusted to the 56th Transportation Company at Long Thanh North and then to Vung Tau, where it was taken on charge by the 388th Transportation Company, which was responsible for disposing of all the Army Otters in Vietnam. • 53277 Government of Cambodia during 1971. (Actual serial unconfirmed). Note: Reported as withdrawn from use and scrapped. Otter 124 was delivered to the United States Army on 19th May 1956 with serial 55-3277 (tail number 53277) and was assigned to the 2nd Aviation Company, Fort Riley, Kansas. This unit was destined for service in Europe after it had received its full complement of Otters and its personnel had been trained on the new type. During April/May 1957 the 2nd Aviation Company flew its Otters from Fort Riley to Brookley AFB, Mobile, Alabama. Here the Otters were loaded on board the 'USS Tripoli', an aircraft carrier then serving with the Military Sea Transportation Service, which set sail for Bremerhaven, Germany, arriving on 16th May '57. Here the Otters were re-assembled and flown to their new base at Illesheim. The 2nd Aviation Company was based at Illesheim for just over two years, until July 1959 when it moved to France, dividing its Otters into three platoons. The Company headquarters and one platoon were based at Orléans, a second platoon at Verdun and a third platoon at Poitiers. The Company remained based in France until disbanded early 1967, as US forces were leaving France. Otter 53277 left the 2nd Aviation Company around the time it moved to France and by January 1962 it was serving with SETAF in Italy. In April 1962 it joined the Headquarters Company, First Brigade, 8th Infantry Division, Germany before going to Coleman Barracks, Mannheim, Germany the following month for maintenance. In November 1962 it re-joined the 2nd Aviation Company in France. It was noted visiting Leeds Airport in England during July 1964 and flying from Gatwick to Prestwick, Scotland on 23rd May '64, returning to Gatwick the next day. It continued flying for the 2nd Aviation Company until July 1966 when it went into storage at Coleman Barracks, Mannheim, Germany. In June 1967 the Otter was allocated to the 66th Aviation Company, Bonames, Germany until October 1967 when it returned to the depot at Coleman Barracks. From there it was transported back to the United States and then onwards to Vietnam, where it was taken on charge by the 54th Aviation Company in March 1968. It continued to fly for the 54th until the unit was disbanded in January 1971. It was one of sixteen Otters flying with the 54th Aviation Company up to January 1971, which were then entrusted to the 56th Transportation Company at Long Thanh North. The following month all the Otters were flown to Vung Tau, where they were taken on charge by the 388th Transportation Company, which was responsible for disposing of all the Army Otters in Vietnam. 53277 was deleted from the inventory in July 1971. 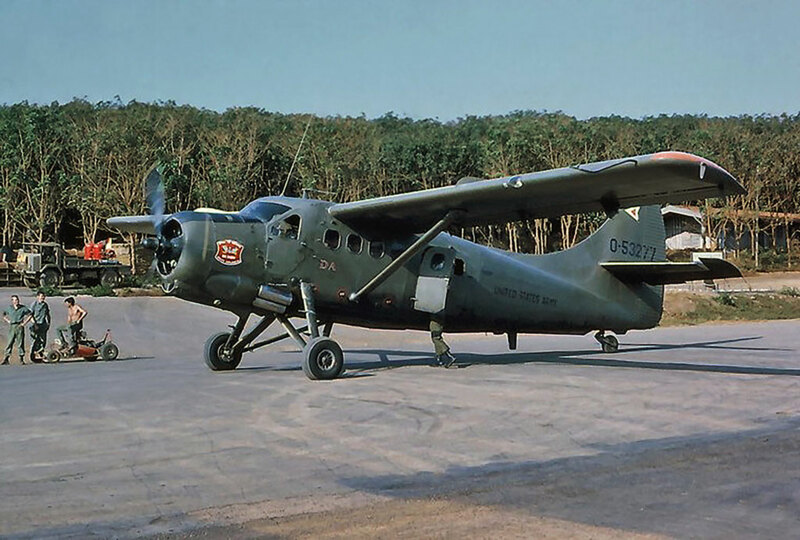 53277 was one of 18 Army Otters handed over to the Government of Cambodia during 1971. Their operation was short lived, and the fate of this Otter can only be recorded as “withdrawn from use and scrapped”.